Blog post written by PhD student Victoria Okoye, originally shared via African Urbanism. Earlier this month (September 2018), I participated in a thought-provoking panel engaging the ‘margins’ in the research process. The panel was part of the two-day workshop ‘Speculative Infrastructures and Cities-in-the-Making,’ which was organized by Jon Silver and Paula Meth at the University of Sheffield and supported by Urban Geography journal and the University of Sheffield’s Urban Institute and Institute of International Development. The workshop sought to respond to “the growing prominence of infrastructure in understanding urbanisation as a dynamic, open ended and contested process of global transformation” and to “reflect on the utility of infrastructure as a problematic in examining cities in-the-making.” This opens up the concept of “infrastructure” as both material and non-material; for example, consider the approach of urban theorist AbdouMaliq Simone, who wrote on marginalized Johannesburg residents’ economic collaborations as an example of “people as infrastructure,” and Michele Lancione and Colin McFarlane’s writing from the urban contexts of Turin and Mumbai and use of the framework of “infra-making” to highlight the material and non-material labors that marginalized residents put into action to produce the alternative forms of sanitation meeting their needs. Both approaches implicate the role of city-planned material forms of infrastructures that aren’t accessible, and highlight the actions, agencies, and relationships of residents who navigate their needs in such absences. People are pushed at the ‘margins’; people live at the ‘margins’; the ‘centre’ as opposed to the ‘margins’ – one could continue along this line of definition of the margins as space, place or social structuration. But what if the margins are not something that can be defined and measured and studied and governed; but rather a politics that can only be performed, arranged, oriented, embodied? In this panel we are interested in exploring the infra-structural (un)making of the margins: the make+shifts, the everyday life, the assemblage of performances and matters that emerge once the veil of social categorisation is lifted, and the margins are set in motion. The notion of infra-structure (or that of infra-making) signals a desire to trace the structural makings of inequalities, social exclusion and poverty, looking at how they are contested and reinvented through the crossroads of everyday urban life. Reading the margins through infra-structures requires a historically informed ethnographic attendance to the multiplicity of life, and to its performative unfolding: a midst in-between which the researcher has no chance of detachment, but only responsibility of commitment. In which ways does everyday life become an infrastructure ‘at the margins’? What is the relational politics of infrastructures such as markets, sewages, bridges, side-walks when they meet with the infra-makings of urban life? Can marginality be reconfigured, as an analytics, from those relationships? What is the ‘infrastructural’ responsibility of the work you do? Does it intersect, does it sustain, does it allow knowledge to flow and liberate? What kind of epistemology is needed to look at life at the margins across north/south divides? Responding to these questions took time, thought, and discussions with two PhD classmates. In the end, I tried to answer these questions in three parts: In conceptualising everyday life at a margin, in learning from a margin, and in researching from a margin. These thoughts and conversations forced (facilitated) me to think about my own research approach and ethics and how I am (how I could be, how I should be) embodying them in my research practice – for example, not just in researching the margins as a research topic, but also as a methodological practice. For example: Whose knowledges within the domain of social sciences research are dominant, and whose knowledges are forced to the margins, I ask myself. Within this PhD process, this is the system in which I operate and act (whether I like it or not) through my readings, citations, and frameworks. I must ask myself: How am I, as a researcher, either challenging or re-producing these dynamics – for example, in the ways I conduct my research, in the ways I relate to fellow knowledge producers? And, are there other options? How do various forms of infrastructure enable everyday life across urban space? I find the margins to be a fuzzy conceptual location – not fixed, but rather always shifting, negotiated, changing, evolving. I don’t think about them as a specific spatial location (such as the periphery of the city), but as an experience of being outside or in-between the dominant planning framework of the city. 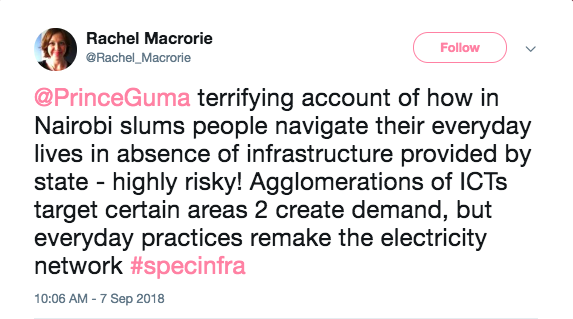 How do residents navigate such experiences – such as being ‘cut off’ from functional electrical, water, sanitation, economic, other infrastructures? I hold scenes in my head of experiences of being at the margins that I have myself seen or experienced: Accra residents disconnected from the city’s water pipes (or even for connected users whose water is not flowing) who hire private water companies to fill large home-installed water storage tanks, purchase water in sachets or bottles, or use yellow, 20-liter jerry cans to tap water from the nearby public water points, or neighbouring houses or businesses, depending on their financial means. Access to water comes to depend not only on the physical built infrastructure in the city, but also the financial resources, negotiations, social capital, and physical labour that urban residents impress in order to make necessary connections. In another example, as means of dealing with persistent scheduled and unscheduled power outages, new layers of economy emerge. Households and businesses with the financial resources purchase and use back-up power generators or batteries. I think of Lagos markets and streets, where vendors can set up small generators connected to power outlets so customers can charge their mobile phones at a fee. I think of the experiences of people in the ‘in-between’ space of freelancing or consulting, who don’t have a formal work space, but still need a space to work, and move between cafes and restaurants where they purchase food and drinks, charge their mobile phones and computers, and hold professional and personal meetings, moving their work and social lives from domestic spaces to these venues operating on back-up generators. I think of residents who repurpose the city’s streets and sidewalks conceptualised by transport engineers as infrastructure for vehicular and pedestrian flows into multifunctional urban commons. Vehicles and pedestrians are forced to negotiate with residents’ everyday claims for vending, residents negotiate with each other and the state their own claims to space for the performance of cultural rites and ceremonies, pick-up football games, hanging out, and social activities. Examining these practices reveals the multilayered and differing experiences of ‘marginality’. I imagine there are multiple margins, where age, gender, financial capacity, location, status and other signifiers can define which infrastructures and networks that marginalised actors can tap into, as well as their negotiations and contestations within spaces of marginality. The social relations and networks through which infrastructure solutions are produced in everyday life are as important to the city as the built infrastructure, and particularly essential for those at the margins. While practices of remaking at the margins create means of access, they also simultaneously highlight for us the very biased politics of planning and design, which is something that both Katherine McKittrick, who theorizes on North American black women’s geographies, and Paula Meth, who theorizes on South African women’s insurgent urban navigations in space, both write about. Their work forces me to ask: Who has the city been designed for, and who has been designed ‘out’ of the city? Which actions and practices have been rendered ‘informal’ and invisible and expendable by historical narratives and powers? How might these operations and relations also reveal each margin as a space with potential for transformation? In our role as researchers researching and writing about cities, how can we shed light on these practices, contribute to discourses, and also use any knowledge we produce to contribute to local processes to address the marginality that we theorize about? I think the five questions meant for provocation only lead me to more questions. 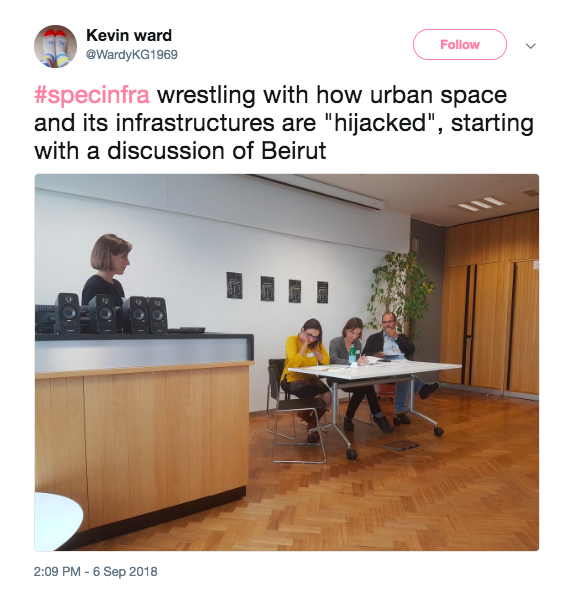 I also hope these discussions continue, whether in similar such platforms, or in person, or online – including on twitter (see #specinfra) and in the comments! 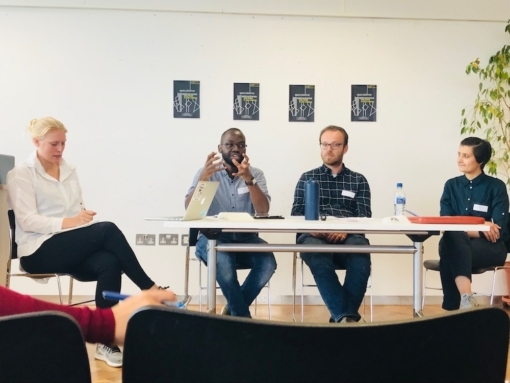 Also, big thanks to my supervisors Beatrice De Carli and Paula Meth for their support, to Jon Silver and again Paula for including me in this conversation, to Tom Gillespie and again Jon for their intellectual contributions on marginalizations processes in Accra that force me to see familiar spaces with new lenses, and to Michele Lancione for his provocations that likewise challenge me in the ways I assume, think, and theorize. Thanks to my classmates Amro Yaghi and Aya Musmar for their support and helping me think through these important questions. It was also so wonderful to participate in a panel with Suzi Hall, Tom Goodfellow, and Tatiana Thieme, whose writings I engage with (in my head) and with whom I had the opportunity to have a wonderfully informative (in-person) conversation that continues to keep me thinking.